Car boot sales are a fun way to make cash! Don’t expect to make a fortune because it’s where everybody goes for a bargain: 50p-£1 is common for things like videos, books, clothes, toys and garden pots; maybe £3-£5 for small kitchen appliances. Be prepared to get up extremely early and for a good deal of loading and unloading. We take a folding pasting table, folding chairs, sheets of plastic to spread on the ground (good for displaying clothes), warm jackets, sun hats, an umbrella, food, flask, a float with change and a book or newspaper to keep you occupied when it gets quiet. It’s great fun if you enjoy the hustle and bustle of markets and you can shop while you’re there. I think they’re great! 1. Put price stickers on all of your goods. 2. 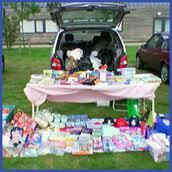 Find your Local Car Boot Sale, ask for the price of stall, Date and time you should arrive. 3. Pack items in smaller cardboard boxes – they are easier to move in and out of the car. 5. Arrive early – ring the organisers to ask what time they suggest. 6. On arrival, unload your table and one box then lock your car while you unpack the box, otherwise people will swarm all over your car, picking up items and confusing you totally. 7. Dealers come early to make offers. Don’t take them unless you are happy with the price; better to tell them to try again later as you’ve only just started selling. 8. Take lots of change and a container with a lid for money taken. Once you have a few notes, lock these in your car. 9. Take a chair, wet wipes, carrier bags for buyers, sandwiches and a drink. 10. Best of all, persuade a friend to share the stall as this halves the cost and ensures you get a toilet break!